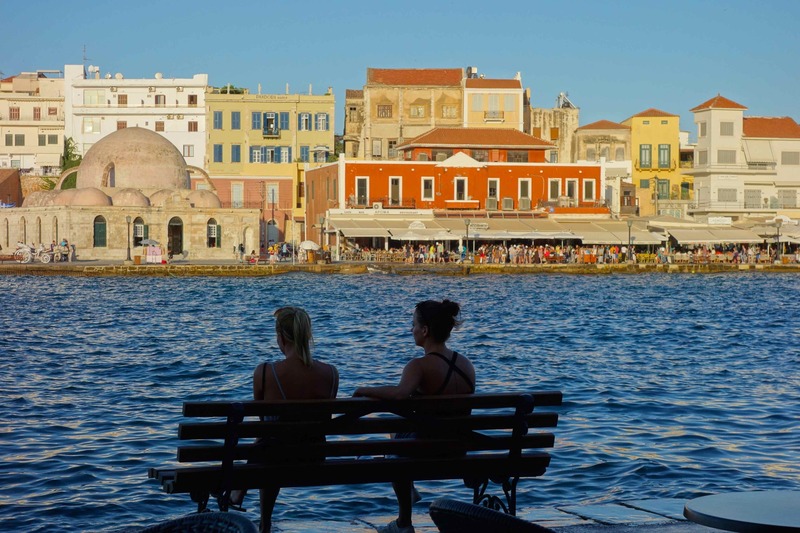 It ended in Crete, Greece. We walked a few meters down our alley to the neighborhood bistro, Olga Gusto. Not our usual activity at 10pm. The owner waved to us with a smile and beckoned us to take front row seats. The final game of the World Cup had just started. We watched, ate a pizza, sipped a beer and a tonic water, and then, just as overtime play started, the owner apologized to the patrons. He’d stayed open an hour later than his usual closing time, but he now had to close as he needed to return the next morning before the 7am opening. So sorry. After all, who knew the game would go into overtime? So, we customers all said we understood and thanked him for staying open so late. We trudged back to our little studio and went to bed. Our last thoughts before falling asleep: who won? Germany or Argentina? Watching games throughout the tournament has had its challenges. Our World Cup viewing had begun a month earlier in a different country, on a different continent. Dar Es Salaam, Tanzania. We knew the World Cup was to begin, but how would we be able see the first match? Our hotel room had a TV, but the time and day difference between Brazil and Tanzania confused us. No problem. One of the hotel staff gave us his timetable for games (thank you!) and told us the channel to tune in…and we did. On to our camping safari, we were far away from World Cup until the last night. We stayed at a German-owned lodge outside Ngorongoro Crater, and their TV room near the bar played to a full house. Magic! We watched with guest from many different countries, rooting for opposing teams. Next stop on our trip was Istanbul, Turkey. Our first night we watched in a restaurant and another night in a little dessert café near our hotel. 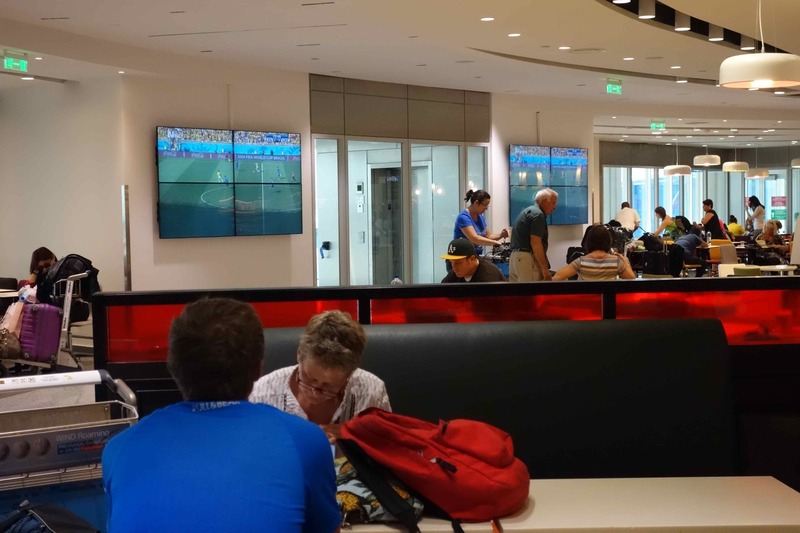 World Cup was heating up, and the airport in Athens was filled with monitors so we travelers wouldn’t miss any of the action. 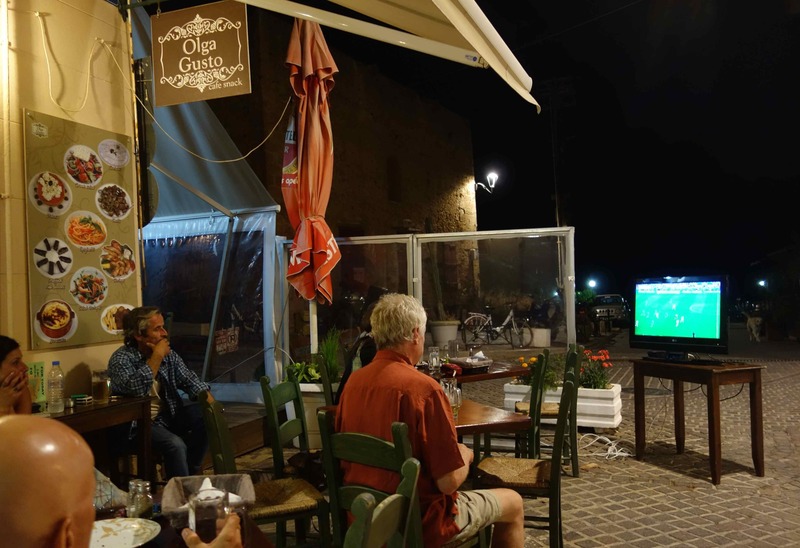 We did manage to see a game at the Music Café Bar on the harbor in Chania, Crete – a spectacular setting for viewing. Beer (for Joe) and chocolate milkshake (for Beth) provided the perfect refreshment. When action waned we could look to our left for this view of the water. 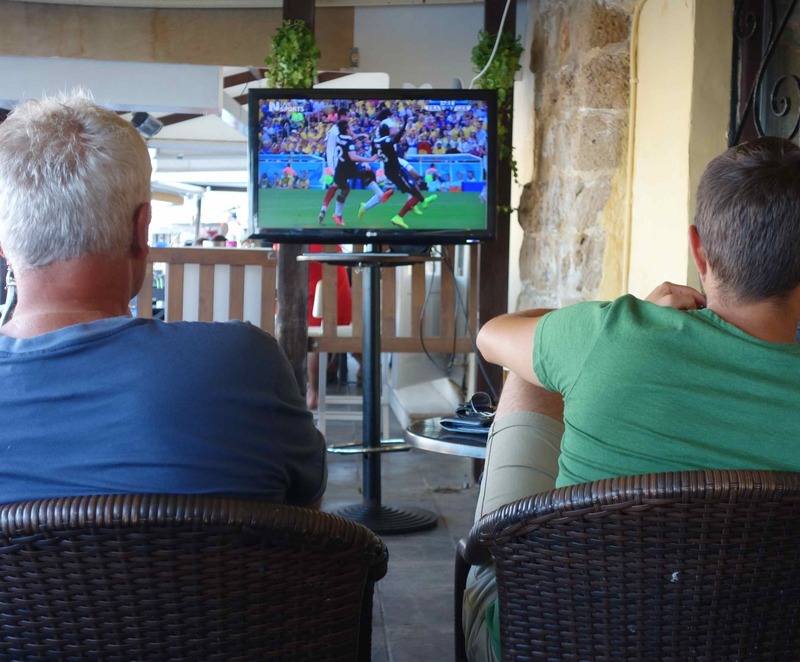 From start to finish we watched World Cup in 3 countries; on islands and on safari; in hotels, restaurants, bistros, and an airport. 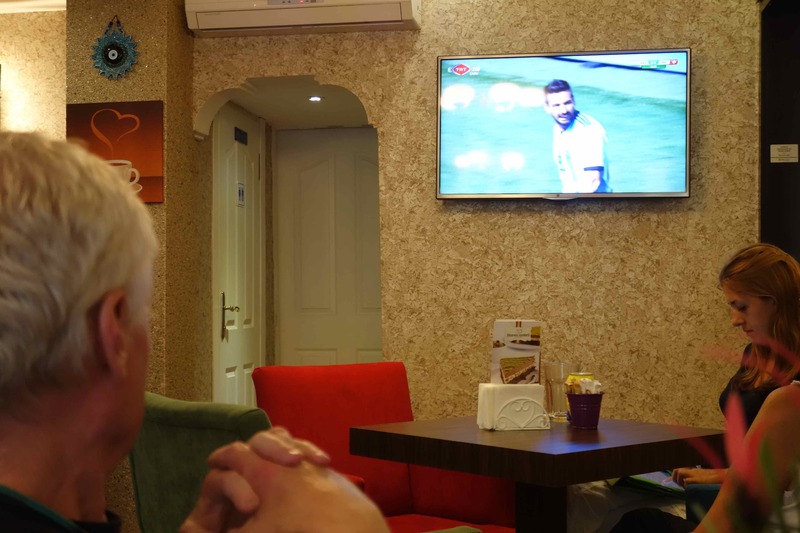 The World Cup definitely had the world – and us – watching. This entry was posted in Around-the World - 2013-14, Greece, Tanzania, Turkey and tagged around the world, Chania, Crete, Greece, soccer, sports, Tanzania, travel, Turkey, TV, World Cup. Bookmark the permalink.